Cutting, welding, drilling, marking: Laser technology guarantees the highest accuracy in the precise manufacture of medical components. New developments such as ultra-short pulse lasers with pulse durations in the pico or femtosecond range open up new possibilities in the manufacture of medical components. They allow high-precision micromachining, which just now makes the production of many small components possible or economical. In laser cutting, for example, cuts and holes at least 2 µm in size can be made at an accuracy in the µm range. The laser produces clean and almost perfect cutting edges. It also offers a high degree of flexibility when cutting different shapes and bodies, largely eliminating the production of tools. The advantages of laser material processing are particularly evident in the manufacture of stents and heart valve support frames. Other typical components include components for minimally invasive surgery, stone trapping baskets, bone saws, orthopedic devices, and numerous implants. Stents are tiny tubes with a lattice structure that are implanted into blood vessels to relieve or prevent vascular constrictions. Important material properties include biocompatibility, safety during installation, visibility during X-rays, mechanical parameters for expansion and, if necessary, degradation in resorbable stents. The thickness of the bars is a critical factor for the flexibility and strength of a stent design. 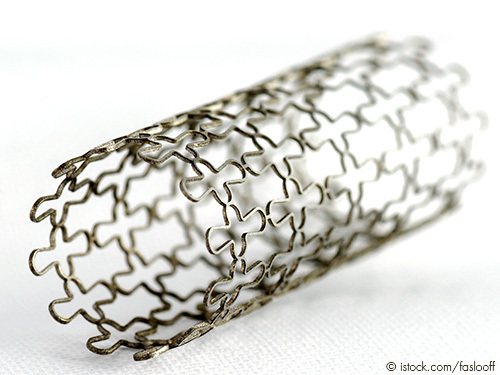 With the laser, stents can be cut at an accuracy of a few µm.